Something went wrong in the lab today ... something went very wrong! 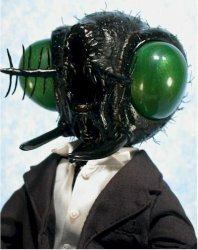 From the 1959 classic film Return of the Fly comes this incredibly detailed, fully poseable figure. Hard to find! Are there some things man was not meant to know? The boundaries of science are pushed to their eerie limits in this sequel to the cautionary horror film classic, The Fly. With help from his uncle Francois, Philippe naively continues his late father's misguided experiments. His traitorous assistant's greedy ambitions propel Philippe into a terrifying limbo -- he's grown the head and limbs of a fly, along with gaining its proportional strength and brute animal instincts. The monster he's become is torn between unleashing savage revenge on his betrayers and the race against time to reverse the horrifying mutation.